When your account is initially set up, a link is sent to your email address to create a password, this password will be used to log you into our Axxess Products. At this time your PASSWORD and your ELECTRONIC SIGNATURE will be the same thing. If at anytime you need to reset your password you may do so by clicking the FORGOT PASSWORD link on the login page. See also SIGNING IN AND OUT. You may also reset your ELECTRONIC SIGNATURE as needed. NOTE: Resetting your password or electronic signature will only change the password or electronic signature, they will no longer be connected. You can update your PASSWORD and ELECTRONIC SIGNATURE to the same thing. In AgencyCore from the home screen click on HOME  MY ACCOUNT  EDIT PROFILE. You will need to enter your old password and electronic signature and then choose a new one, they can be the same thing. Can a clinician view the Medicare eligibility verification? Medicare eligibility verification is permission based. To view the document, the clinician must have the permission in AgencyCore to do so. Why can't I see a list of all my patients? Either the patient has not been assigned to you or your permissions/roles do not allow you to see all of your patients. Have your administrator check your permissions/roles and change if necessary to allow you to see all of your patients. Hover over the Home or Schedule menu tab and choose My Schedule/Tasks. Once in the My Schedule/Tasks page, select Excel Export in the top right corner of the screen. You can then print the document from Excel. Hover over the Home menu tab, choose My Monthly Calendar, then select Print. NOTE: This will print an entire month at a time. Hover over the Reports menu tab and choose Report Center. When in the Report Center, under Schedule Reports, select Employee Weekly Schedule, Employee Daily Work Schedule or Employee Monthly Work Schedule, then select Export to Excel to download and print. How do I change my scheduled visit date to match the actual visit date? In the Patient Chart or Schedule Center, find the patient you were scheduled to visit. Under the Action column on the bottom right side of the page, click Details. This is a permission-based field. In Details, change the scheduled date and actual date to match. If a nurse completes a visit, on a date other than the date scheduled. What should they do? To make the scheduled date and actual visit date match, click on Details under the Action column. Change the schedule and actual dates to match. 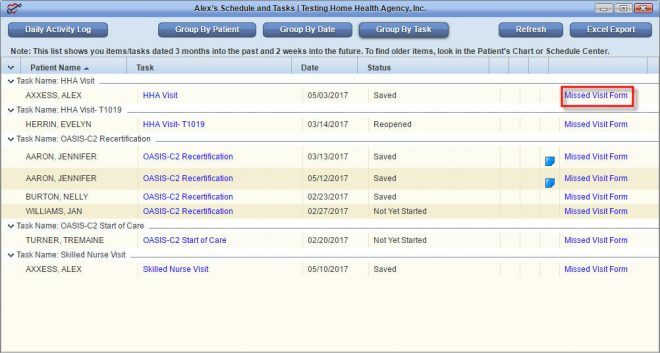 You may also choose to leave the dates separate and view a Schedule Deviation report to see differences between scheduled visit dates and actual visit dates. When my schedule changes, how do I change my visit date? 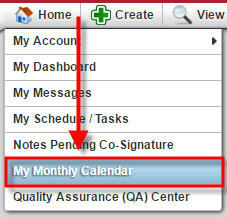 Open the document/task, then click on the Calendar icon in the top left portion of the page. From here select the correct date. Be sure to Save/Complete the document. 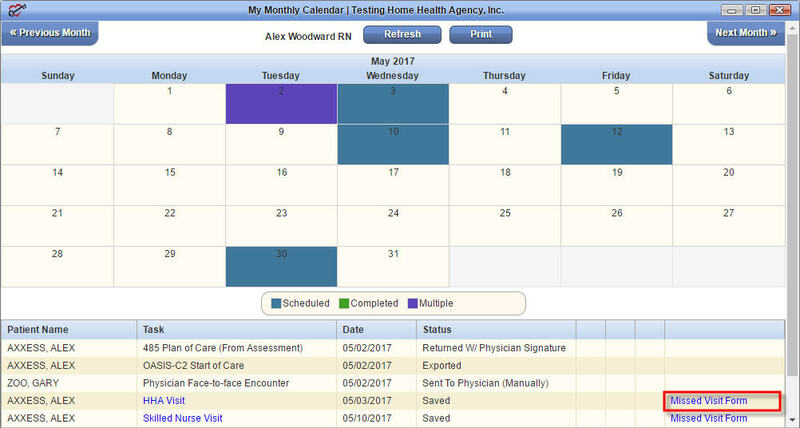 Can a clinician schedule their own visits in Axxess' AgencyCore? The ability to schedule visits is permission based. To schedule visits, make sure the clinician has the appropriate permissions in their user profile. How do I get a list of Past due Recertifications? If you have the permission, select Past Due Re-certifications from your Dashboard. You can also find them under the View tab or from the Scheduled Reports under the Reports tab. How do patients sign visits/progress notes in Axxess' AgencyCore? It is not a Condition of Participation or Medicare rule that a patient signs a visit/progress note. If your agency's policy is to have visit/progress notes signed by the patient, print the note and have the patient sign the printed document. We may provide such a feature in the future where patients can sign on your Point-of-Care device. You may want to look at the Axxess Mobile application for more information with the Electronic Visit Verification. 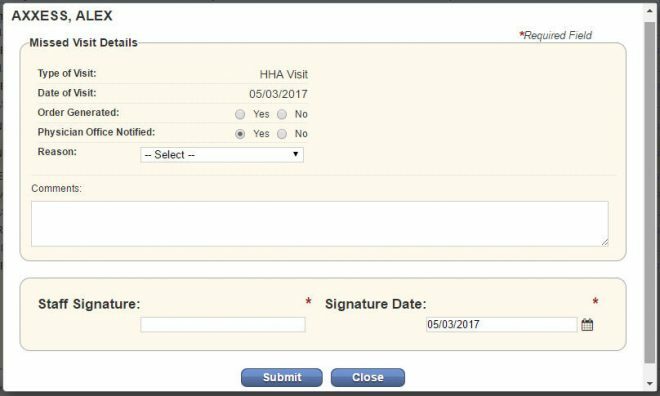 required to enter your electronic signature, the date the missed visit form was signed and then click Submit. How often can OASIS assessments be submitted in Axxess' AgencyCore? As often as you would like. If the OASIS assessment is completed, you can submit. How do I check my OASIS assessment for errors? You can check for errors at any time while in the OASIS task by clicking on Check for Errors either at the top or bottom of the page. After completing the OASIS, you must click Save and Check for Errors. To check for clinical and logical inconsistencies, click on OASIS Scrubber before completing an OASIS. When I receive a warning from the OASIS analysis scrubber, what does it mean? The OASIS analysis scrubber is a logical and clinical inconsistency checker. The inconsistencies identified are only warnings, not errors. The scrubber is saying "is this really how you want to answer these questions". If you determine the answers are correct, ignore the warning. If the warning could impact your reimbursement or the answers are incorrect, go back to the OASIS and make the appropriate corrections. What does the OASIS Scrubber/Analysis do? The OASIS Scrubber/Analysis is a logical and clinical inconsistency check. It will check for possible inconsistencies in answers and give you warnings associated with those answers. These are only warnings. You do not have to change your answers but you can if you choose. I completed an OASIS assessment but cannot find my Plan of Care. What happened? Make sure that you have signed the OASIS and clicked complete. The Plan of Care will not generate until it is signed. If you signed and completed the OASIS, the Plan of Care may not have been generated. This can happen if you did not fill out the Plan of Care questions on the OASIS. Does Axxess' AgencyCore provide an audit trail, noting the date/time an actual visit took place? Yes. On most documents in AgencyCore, there is an activity log that provides an audit trail. Click on the paper icon that says Activity Log. You can also go the Details for each document and scroll to the bottom of the page to view the Audit Trail/Activity Log. How do I change the date or details of a completed/signed visit note or document? 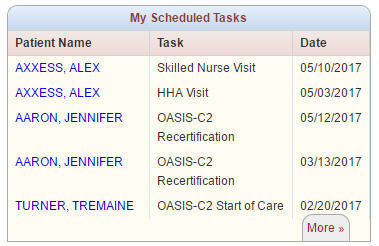 Under the Action column on the bottom right side of the page in the patient's chart, click on Reopen Task. Make your corrections, sign and complete. Reopen Task is permission based. How do we document coordination of care with another discipline or across a multi-disciplinary team? From within the Patient's Chart, click New Communication Note. From within a skilled nursing note, click New Communication Note. From the Schedule Center, click the appropriate date and schedule a communication note to the appropriate clinician. First, you schedule a discharge OASIS Assessment or a discharge summary depending on the discharge circumstances. Complete the OASIS, then change the patient status to discharged within the patient chart. Go to the View tab, find List, choose Patients. Select Discharged from the drop-down menu, then select Generate. How do you add COMMENTS to the Patient’s Profile? To add a comment to the PATIENT’S PROFILE go to the PATIENT’S CHART and click edit. On the fourth tab, CLINICAL/DIAGNOSIS, scroll to the bottom of the page to CLINICAL COMMENTS. The text entered in the CLINICAL COMMENT will appear in the comment section of the PATIENT PROFILE. If the user's permissions have Bypass QA checked under the clinical section, uncheck the box and everything from that point forward will go to the QA center. Can a case manager or QA nurse sign documents that have been completed by another clinician? How do I print my medication profile? More information on Medication Profiles can be found in the Help Center. Once inside the medication profile, select Print Medication Profile. How does an RN co-sign an order created by an LVN in AgencyCore? Does Axxess' AgencyCore populate the vital signs log automatically? Yes, AgencyCore populates the vital signs log automatically using the data entered on each nursing note. How do I document incident or infection reports? You can document an incident or infection report from within the nursing note or from the Create tab at the top of the page. Can therapists and other disciplines complete their progress notes/documentation in Axxess' AgencyCore? Anyone that is entered as a user can complete documentation in AgencyCore. Where can I find the Plan of Care? You can find the Plan of Care in the patient chart or schedule center under tasks or in 3 different areas within a skilled nursing note. How can I be assured that the Discharge summary includes all the facts necessary to record all episodes and interactions? Everything you need to complete a detailed and accurate discharge summary is included in the form. I signed and completed an order/Plan of Care/ Evaluation, but it is not showing up in the QA center. Your permissions may allow your documentation to bypass the QA Center. In general, documents signed and submitted/completed will go to the QA center to be reviewed. Some staff (case managers, nursing directors, etc.) can submit documents that will bypass the QA center because their permissions have been set up that way.